Roof Repairs and Roof Maintenance are unwelcome parts of owning a Home. No matter what type of roofing system is used, inevitably that systems will experience some type of problem during the roofs lifetime. When that time comes, Adept Roofing is there to help. When the need for a Roof Repair arises, immediate action should be taken to prevent further damages. Failure to make repairs as soon as soon as they are identified will allow water to penetrate and cause further costly damages inside the home. If your Home or business is already showing signs of water damage in areas like the ceiling, walls, around light fixtures or skylights it’s critical you take action immediately. We provide top quality Slate Repairs in Allentown, Bethlehem, Easton and surrounding areas. We install all Replacement Slates using quality hand picked Slate Tiles. All slates are hung using stainless steal slate hooks or copper nail & bibs. For more information, please see out Slate Repairs page. Often home owners will notice missing or damages Roofing Shingles on their home but choose to do nothing about it until they see visible signs of a leak inside the home. This is a big mistake. When an area of a roof fails allowing water to penetrate the Building Structure, the water must also find a way through the Felt Paper under the Shingles and soak the Roof Decking. The water then leaks from the soaked Roof Decking down to the Rafters. Water will then drop from the Rafters to the ceiling where it will collect in small pools. The water must then soak through the ceiling material and into the living space showing itself as a wet spot on your ceiling. This process may take weeks or even months before it finds it’s way into the structure and starts to show viable signs of water leakage. By this time, much of the building structure has been soaked with water for long periods of time. Prolonged damp conditions coupled with the warm air in your attic space create the perfect conditions for wood rot and mold to flourish. Once the water starts to drip from your ceiling you must also concern yourself with damages it can cause to the interior walls, ceiling, carpet, floors, furniture and even cause structural deterioration. You may find when consulting a Roofing Contractor that does not Specialize in Roof Repairs will often suggest that you completely replace your Roof. We have found that about 60% of the Roofs we evaluate, this is completely unnecessary. Most all Roof Leaks can be Repaired without completely replacing the Existing Roofing. Leaky Roofs are usually caused as a result of missing shingles or ineffective flashing in the areas of roof protrusions. Roof Leaks caused by Missing Shingles, Damaged Shingles and Roof Protrusion Flashing can be fixed easily and without the need of fully replacing the roof. Is My Roof Past The Point Of Repair? Roofs approaching 25-35 years old can often still be repaired but at this age it does become more likely you will need Full roof Replacement. Brittle and crumbling shingles. 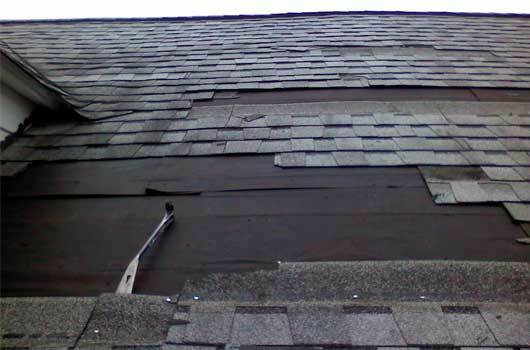 A shingle gets to a brittle state when the sun drys it to a point that all elasticity is non existent. 20% or more of the area in need of replacement. When this much of an area of a roof is in need of replacement due to missing or damaged shingles, it’s more economical to completely replace the area with new shingles. We understand how stressful it is living with a roof leak. First and foremost, Adept Roofing offer their clients prompt and professional Roof Repair Services. We understand the urgency of your needs and we respond quickly and professionally to every call and get you answers to your questions, solutions to your problems Fast. At Adept Roofing, we believe communication is the key to a headache free Client/Contractor experience. We will open clear lines of communication through out all phases of the project from beginning to end. Our work is obtained mainly by “Word Of Mouth” referrals. With this in mind, our main goal is of course to solve your Roofing Problems, our second goal is to leave you with a stress and headache free Client/Contractor experience. A pleasant experience you won’t mind sharing with others and would be happy to refer our Roof Repair Services to friends and family. We will work within your budget and help you make informed decisions to the best possible resolution to your Roofing or Roof Related Problem. We offer Free Estimates, provide you with detailed written proposals, prices to fit every budget, our work is always of the highest quality, completed in a timely manor and our job site’s are always left neat, clean and property damage free. When you call Adept Roofing, we will respond to your inquiry and get you answers within a timely manner. During the initial consultation, we will never pressure you into replacing the entire Roof. Most all Roof Leaks can be fixed without the need for Roof Replacement. Once we have diagnosed the cause of your Roof Leak, we will offer you all options to suite your budget and your long term needs. As we proceed with the Roof Repair, we will often take pictures of the problem area to show you exactly what the problem is. This allows us to show you why we are suggesting certain solutions. Unfortunately, it is not uncommon in our industry to have problems, questions and concerns after a project is finished. So what happens if there is a problem on the exact same spot? We come back on our own time and fix it for Free. We are completely dedicated to responding to your needs quickly, offering immediate solutions to your problems, providing high quality work while properly communicating with you throughout the entire process!